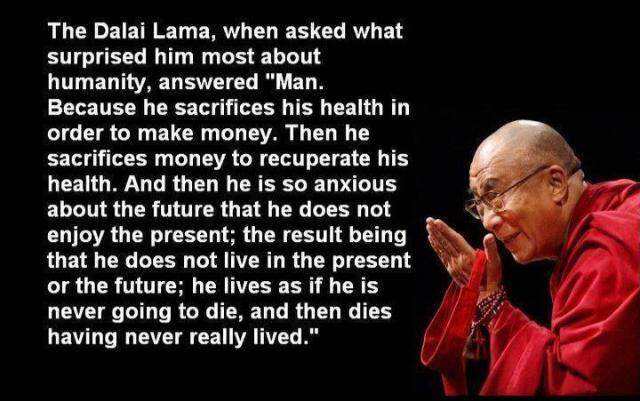 I can't remember where I came across this recently, but it certainly made me think. How many of us are really living? Or are we just chasing the money, wearing ourselves out, not having time for family, not taking time for ourselves, just going through the daily grind? Then we get so worn out we get sick and spend a fortune trying to get better, but we "push through" because if we take a break the world will fall apart, right? We don't let our bodies heal, instead we continue working, putting strain on our sick bodies when we need to recuperate. We stress about money, how we will cover everything right now, we focus so much on the future it ends up getting here so much faster than if we just slowed down, relaxed and lived in the present. I know I am guilty of it. I have a passion for finances, but my family comes first and I have been changing my life so that I am living more in the here and now, less in the future and focusing less on my finances. It has been quite freeing. And you know what? The world hasn't fallen apart as I have stepped back. In fact MY world - my family and my life, has improved.